Astronomers at Penn State have used the Hubble Space Telescope to find a blistering-hot giant planet outside our solar system where the atmosphere "snows" titanium oxide. These Hubble observations are the first detections of this "snow-out" process, called a "cold trap," on an exoplanet. This discovery, and other observations made by the Penn State team, provide insight into the complexity of weather and atmospheric composition on exoplanets, and may someday be useful for gauging the habitability of Earth-size planets. The astronomers didn't go looking for titanium oxide specifically. Instead, their studies revealed that this giant planet's atmosphere is cooler at higher altitudes—which was surprising because it is the opposite of what happens on other hot Jupiters. Titanium oxide in the atmospheres of other hot Jupiters absorbs light and reradiates it as heat, making the atmosphere grow warmer at higher altitudes. Even at their much colder temperatures, most of our solar system's gas giants also have warmer temperatures at higher altitudes. 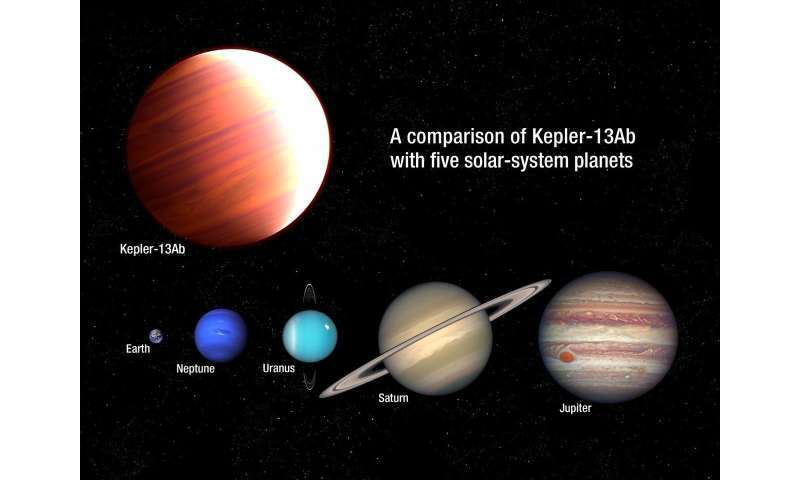 The astronomers suggest that powerful winds on Kepler-13Ab carry the titanium oxide gas around, condensing it into crystalline flakes that form clouds. Kepler-13Ab's strong surface gravity—six times greater than Jupiter's—then pulls the titanium oxide snow out of the upper atmosphere and traps it in the lower atmosphere on the nighttime side of the planet.